This is a VERY Dazzling 925 SILVER bracelet. The main pendant is a large star followed by two large crystals, the rest of the bracelet is made up of smaller crystals and smaller stars. 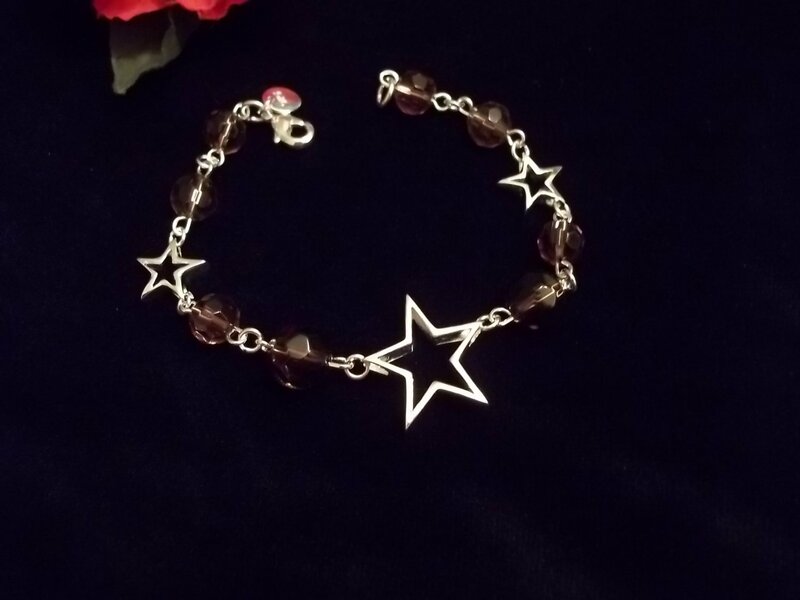 A row of crystal and stars to surround you wrist. Bring out the star in you with this!! Would make a perfect addition to your summer wardrobe. The dusty violet crystal beads will take in the sun and sparkle! **This bracelet has the 925 STAMP. FREE SHIPPING TO MANY COUNTRIES!! Length - 7" but can adjust to approx 8"
Item is shipped within three business days of payment approval. Please allow ample shipping time depending on the item destination, your patience would be appreciated .We offer free shipping to most countries and in order for us to continue to offer this service to our customers it is no frills shipping. If you have ANY problems, concerns or questions please contact us for a prompt response. Once the item has arrived we would appreciate Your feedback and rating. As we are an online store We depend very heavily on customer satisfaction and good ratings. Before leaving negative or neutral feedback please contact us.